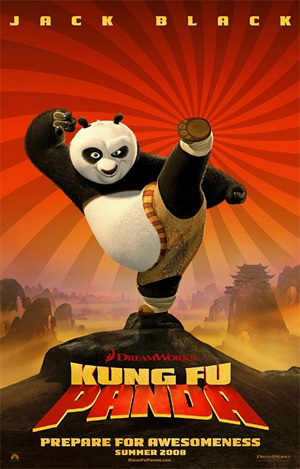 "Kung Fu Panda" features Jack Black as Po the Panda, a lowly waiter in a noodle restaurant, who is a kung fu fanatic but whose shape doesn't exactly lend itself to kung fu fighting. In fact, Po's defining characteristic appears to be that he is the laziest of all the animals in ancient China. That's a problem because powerful enemies are at the gates, and all hopes have been pinned on a prophesy naming Po as the "Chosen One" to save the day. A group of martial arts masters are going to need a black belt in patience if they are going to turn this slacker panda into a kung fu fighter before it's too late. Po is a panda, and he lives in China. It doesn’t bother him that his country is hosting this year’s Olympics Games. He is too busy dreaming about being a Kung Fu master being celebrated by his town folks, which consists of adorable pigs, rabbits and other cuddly animals. However, Po is also a lazy and sluggish panda. He has been working in a noodle shop all his life. His father is a duck (don’t ask why), and he collects action figures of his Kung Fu idols, the legendary Furious Five. This reviewer collects action figures of his favourite heroes too, but he is still leading a less than glamourous life. While that’s beside the point, a panda can dream, can’t he? And it is only in a movie (an animated one too) that losers like Po can become a hero, just by believing in yourself. The 88-minute animated feature is the latest offering from Dreamworks after last year’s blandly concocted movie about a certain green ogre. Thankfully, the studio gets its groove back this time round, with its jokes and antics coming fast and furious at the audience. It doesn’t matter whether you are young or old (the important thing is to be young at heart, get it? ), because you will enjoy this family friendly summer flick immensely. From the minute the traditional 2D opening sequence to the detailed computer generated 3D crowd scenes, viewers will be transported to a, well, typically westernized world of ancient China. The exoticism is in your face, and enjoyably so too. The caricatured characters and backdrops are spot on, and make for delightful viewing pleasure. Great detail has been paid to the architecture of buildings and temples, the landscape of mountains and rivers, right down to the tacky Chinese influenced music score composed by Hans Zimmer and John Powell. Heck, there are even literal but amusing translations of familiar Kung Fu moves and seemingly wise and inspirational quotes. But what you will enjoy most about this money milking movie (yes, bring on those fast food toys, T shirts and other related movie merchandise) is Jack Black’s (Be Kind Rewind, King Kong) hilariously side splitting rendition of Po the fat panda. You can almost feel the actor having a hell of a time providing the voice for this character. There are countless riotously hysterical moments that will have you laughing uproariously. This role is made for the man. Dustin Hoffman (Stranger Than Fiction) provides the voice of the very huggable Shifu with the right amount of slapstick and dignity, while Ian McShane (The Golden Compass) gives a chilling performance as the villainous Tai Lung. The star studded voice cast also includes the underused Angelina Jolie (Beowulf) as Tigress, Lucy Liu (Rise) as Viper, Seth Rogen (Superbad) as Mantis, David Cross (Alvin and the Chipmunks) as Crane and our very own Jackie Chan (who probably has less than five speaking lines in the entire movie) as Monkey. But who cares whether these (probably) overpaid actors are given meaty roles or not? We are too busy enjoying the flick, and dreaming that we can be Kung Fu masters ourselves one day too.